Agriculture, bees is kept, it the country lives, and the chance to process the tree increases by cutting the tree, and producing something with the material of the tree. The page that explained how to make the structure where the usage of the tool to do construction that used the tree and the machine and trees had been used was made. This photograph is an installation of Φ255mm slide round saw Rage3 of Evolution on a special installation stand. The cut material (wood) is fixed, and the rim saw is done in the slide and a slide round saw is cut. Because the slide mechanism is steady, wood can be cut beautifully and early. If the same size is processed, it is possible to make it easily many. The material is also easily good it is not only right-angled but also to cut the angle horizontally putting it. Of course, it can be easily done to be vertical and to put the angle. If the usage of a slide round saw is devised, the ditch can be carved for the material. 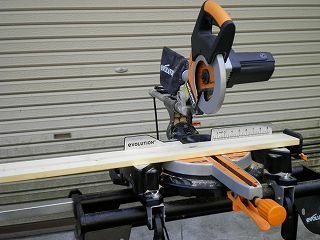 It comes to make doing woodwork with DIY beautiful happily when there are a usual electric round saw and an electric plane besides a slide round saw. It injures, and however, it returns and finish worsens when it makes a mistake in the usage. The width of woodwork extends if a usual saw, the plane, and the flea can be mastered besides the power tool. If the experience is acquired, even the amateur comes to be able to use there well thereat.